Cupping is an ancient method of treatment whereby a glass or cup is placed on the body surface and a vacuum is created and toxins or morbid material is sucked out from the deeper tissues or the diseased organs of the human body. According to a Hadith appearing in Sahih Bukhari, the Prophet (sallallaahu alayhi wasallam) is quoted to have said that there are no remedies comparable to cupping or blood-letting. Cupping is known as Hijamah which means reducing in size i.e., to return the body back to its natural state. Cupping diverts the morbid material responsible for pain and inflammation by letting down sufficient quantity of humours (akhlaat). Earliest record of cupping is to related famous alchemist and herbalist Ge Hong (281-341 AD). The Chinese expanded the utilization of cupping to include its use in surgery to divert blood flow from the surgery site. After extensive research the clinical efficacy of cupping therapy is confirmed and has become a mainstay of government hospitals in China today. The earliest pictorial record of cupping was discovered in Egypt, around 1500 BC. The oldest recorded medical textbook written around 1550 BC in Egypt mentions about cupping. The Holy Prophet (sallallaahu alayhi wasallam) of Islam too is said to have used this therapy known as Al-Hijamah and he even used to pay the persons who applied this therapy on him. The cupping therapy is back into vogue today after several centuries. Traditionally, cupping has been regarded as an effective treatment for a number of musculo-skeletal disorders and as a general measure to maintain and promote well-being. Therefore, Cupping Therapy is indicated for a number of problems ranging from eye ailment, headache, arthritis, sciatica, gout, piles, constipation, menstrual problems, uterine cramps, back pain, asthma, cold, blood disorders, infertility, varicose veins to name but a few. Cupping is more beneficial for skin, muscles, joints, and digestive organs. It diverts the old stagnant blood within the skin and increases the peristaltic movements of the intestines thereby improving the power of digestion. Cupping is said to be beneficial when applied on a person who is empty-bellied. A Hadith from Tirmidhi informs: Cupping on an empty stomach is medicine but a disease if done on full stomach. In the final analysis, cupping or al-Hijamah is powerful healing method which has been in vogue in ancient times and has found endorsement from the Holy Prophet (sallallaahu alayhi wasallam). They said: You have worked in Oxford for twenty years on an academic project looking at the history of the Islamic sciences in India and its Madrassas and centres of learning. So what is the best madrassa in the long history of India, given the multitude of its madrassas and the variety of its institutes and the differences in its centres of teaching? I said: That would be Darul Ulum Deoband. They said: We find this statement of yours odd. Are you being truthful or [speaking in] jest? Are you being serious or joking? I said: I seek refuge in Allah from being from the ignorant. Do you want me to be sectarian or to be sincere? To be discerning or to mislead? To be prejudiced or to be just? They said: We know you to be sincere, discerning and just. So reveal to us the aspects in which you prefer Darul Ulum Deoband over the other madrassas. I said: That would take volumes [to write]. They said: Spare us your volumes as we have become tired of them. Summarise for us some of their points which would be indicative of others and we will be most grateful to you. I said: I have summarised them in three points so listen to them and remember them. The first point is the attention paid by Darul Ulum to the noble prophetic hadiths. The teaching curricula in India were deficient in noble prophetic hadiths. Those in charge of the curricula had not stipulated any books of hadith except for “Mashariq al Anwar” of Saghani which they then replaced with “Mishkat al Masabih”. As for the six primary collections, they were not added to the studied texts until the arrival of Imam Ahmad ibn Abd al-Rahim, better known as Shah Waliullah al-Dehlawi, who added some of them, as well as the “Muwatta”, to the curriculum. Things remained like this for a century, then Darul Ulum was established. It was the first madrassa to concern itself with teaching the six primary collections as well as the “Muwatta”, according to the narrations of both Yahya ibn Yahya al-Laithi and Muhammad ibn Hasan al-Shaibani, and “Sharh Ma’ani al-Athar”. This is a merit by which Darul Ulum Deoband is distinguished from the other madrassas in India, and even across the entire islamic world. They said: You have an interest in isnads (chains of narrations) and ijazahs (certificates of authority). So who are you connected with from the hadith scholars of Deoband? I said: I am connected with all of them via many routes and various isnads, and to Allah belongs all praise and thanks. They said: So what is your highest sanad to them, the most noble and the strongest? I said: That would be my narration from the most erudite scholar and muhaddith Ahmad Rida al-Bijnuri, the commentator of Sahih Bukhari, from the Hafidh of India, it’s Muhaddith and Imam in the hidden defects in hadith and narrator criticism, the erudite scholar Anwar Shah al-Kashmiri, followed by my narration from the erudite scholar and muhaddith Nasir Ahmad Khan, as well as from the long-lived Shaikh Ahmad Ali al-Surti, both from the long-lived Hafidh Abdur Rahman al-Amrohi. They said: You have certainly attained high, noble chains of narration, all of whose narrators are imams of fiqh and accurate experts of hadith. So bring us the second point. I said: The second point is Darul Ulum Deoband’s revival and dissemination of the Sunnah of the Master of the Messengers and its strenuous effort in eliminating innovations and newly invented matters. For all of India was under the influence and powerful grip of innovations and superstitions until the scholars of Deoband stood up and opposed them and removed them. We do not know of any movement which played a role similar to that of Deoband in eliminating innovations and superstitions and preventing evil. They said: Who is their head and leader in that? I said: The imam, the unique luminary, the pious, the pure, the devout scholar, the inimitable Shaikh Rashid Ahmad al-Gangohi, may Allah show him abundant mercy, raise his ranks and make him of those close to Him. No mother has been capable of giving birth to his likeness and history has been unable to produce similar to him. He is the one for whom my heart has been filled with love and appreciation. He resembles the two imams, Sufyan al-Thawri and Ahmad ibn Hanbal, in the purity of his heart and the strength of his faith, in his servitude to Allah and submission to Him, and in his revival of the Sunnah and vanquishing of innovations. They said: Has anyone else been similar to him in the long history of India? I said: [Can there be anyone] other than this one? They said: We beseech you to answer our request. I said: Will you excuse me (from having to mention anyone in a similar way)? They said: We do not excuse you. I said: Well if you refuse then perhaps Imam Muhammad Isma’il ibn ‘Abd al-Ghani ibn Waliullah al-Shahid, may Allah have mercy on him. I adjure you to not ask me for a third to go with these two. They said: Bring us your third point. I said: The third point is Darul Ulum’s production of practising scholars who cultivated their inner aspects before building their outer aspects, who purified themselves of all depravities, who cleansed their hearts of envy, hatred, malice and loathsomeness, who lived lives of piety, cautiousness, asceticism, contentment and sufficiency, who devoted themselves to worship and to the teaching and upbringing of the people, and who prepared followers who resembled them in purity and virtue and who spread to all corners of India and even beyond, calling mankind to the worship of Allah, exalted is He, and to following the Sunnah of the Prophet, may Allah’s peace and blessings be upon him. I said: The list will be long. They said: Tell us the names of their most eminent scholars. I said: The first of them is the Imam, the caller [to Islam], the educator, Muhammad Qasim al-Nanotwi, the founder of Darul Ulum and colleague of the erudite scholar Rashid Ahmad al-Gangohi. Then the erudite scholar and muhaddith Khalil Ahmad al-Saharanpuri, as well as “Shaikh al-Hind” Mahmud al-Hasan al-Deobandi, Shaikh ‘Abd al-Rahim al-Raipuri, “Hakim al Ummat” Ashraf ‘Ali al-Thanwi, Shaikh ‘Abd al Qadir al-Raipuri, and the erudite scholar and muhaddith Husain Ahmad al-Faizabadi al-Madani. They said: This will suffice for us. We have heard you speak in the most laudatory terms of the erudite scholar Rashid Ahmad al-Gangohi. Can you please point us to a source containing his biography? I said: The best biographer of him was the erudite scholar and muhaddith Muhammad ‘Ashiq Ilahi al-Mirti, who wrote [his biography] in urdu. They said: Does he have an Arabic biography? I said: His biography in “Nuzhat al-Khawatir” is one of the best and most comprehensive. I have had the intention to write a detailed biography of him and have collected the material so ask Allah that he gathers my resolve and makes me successful in completing it. 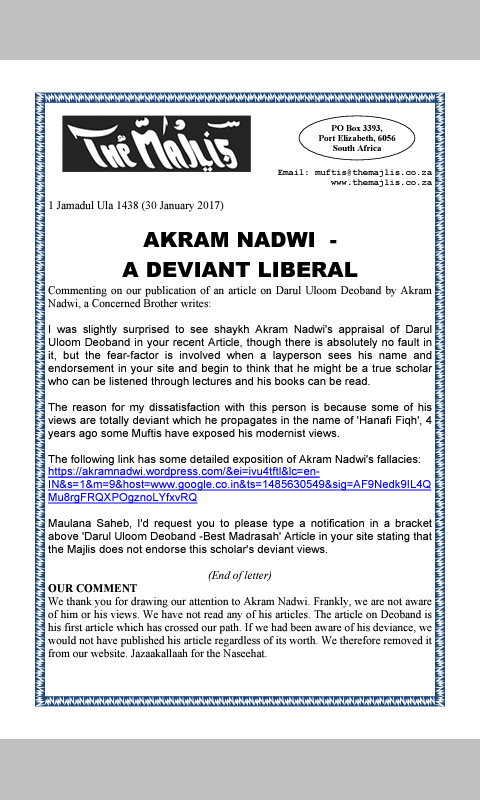 I was slightly surprised to see shaykh Akram Nadwi’s appraisal of Darul Uloom Deoband in your recent Article, though there is absolutely no fault in it, but the fear-factor is involved when a layperson sees his name and endorsement in your site and begin to think that he might be a true scholar who can be listened through lectures and his books can be read. The reason for my dissatisfaction with this person is because some of his views are totally deviant which he propagates in the name of ‘Hanafi Fiqh’, 4 years ago some Muftis have exposed his modernist views. Maulana Saheb, I’d request you to please type a notification in a bracket above ‘Darul Uloom Deoband -Best Madrasah’ Article in your site stating that the Majlis does not endorse this scholar’s deviant views. We thank you for drawing our attention to Akram Nadwi. Frankly, we are not aware of him or his views. We have not read any of his articles. The article on Deoband is his first article which has crossed our path. If we had been aware of his deviance, we would not have published his article regardless of its worth. We therefore removed it from our website. Jazaakallaah for the Naseehat. We Thank the respected Maulana Saheb of Majlisul Ulama for heeding our mail and clarifying their stance on the said person and the above article. RE-INTERPRETATION OF ISLAM, which is a clamour of the westernized modernist deviates, is a subtle ploy of shaitaan for the abrogation of Islam. Islam is the Qur’aan and Sunnah which are ensconced in what is known as the Shariah. There are two groups of satanic miscreants who desire the abrogation of Islam – that Islam which has been transmitted to us from the era of the Sahaabah. (1) The modernists: These are the Zanaadaqah (plural of Zindeeq – one who masquerades as a Muslim when in reality he is a kaafir) who acquire their (heresy/kufr) zandaqah from their oriental masters and tutors of the kuffaar universities. They are the ‘professor’ chaps and the characters with ‘doctorate’ degrees who hallucinate that they are authorities of the Shariah. Trapped in the straitjacket of western indoctrination, these zanaadaqah clamour for the abolition of Islam. However, the nifaaq in their hearts does not permit them to make an outright call for abolition. Shaitaan adorns the issue for them. He has infused into their brains the idea of ‘re-interpretation’. With this bogey, the modernist zanaadaqah seek to bamboozle the ignorant masses with the utterly baseless and kufr argument that the Shariah is the product of the opinions of the Aimmah-e-Mujtahideen and Fuqaha of Islam. Obviously, this is the furthest from the truth. It is a satanic canard which they attempt to peddle with typical orientalist obfuscation which to men of intelligence portrays their massive lack of Islamic and Imaani perspective. These Zanaadaqah are abortively at great pains to re-interpret, that is to cancel and abrogate the Qur’aan and Sunnah, on the basis of the ‘spirit’ underlying the ahkaam to the exclusion of the letter which is the direct product of Wahi, be it Wahi Matluw (the Qur’aan) or Wahi Ghair Matluw (the Ahaadith). For example, they seek to abrogate the law of polygamy with the moral injunction of equality and justice between the plurality of wives. With this moral aspect, they perpetrate the kufr of claiming that if a man is not just to his wives (which is a future act subsequent to Nikah, not prior to Nikah), the Nikah to a second, third and fourth wife is not permissible, hence it is permissible for a kuffaar entity wallowing in the filth of janaabat and kufr to proscribe the Qur’aanic permission. This is just one example of the kufr of the modernist zanaadaqah. Redefining and re-interpreting the Shariah are actual satanic attempts to destroy Islam. It is a massive kuffaar conspiracy. (2) Salafi’ism: Salafi’ism is the other subtle satanic plot to destroy the original Deen. It is the attempt to destroy Islam under guise of the ‘Qur’aan and Sunnah’. The abandonment of the Taqleed of the Four Math-habs which are the Guardians of the Qur’aan and Sunnah – of original and pure Islam – is also reinterpretation in another form. The Qur’aan and Ahaadith are subjected to mutilation with baseless interpretation. Salafis reject the original pristine Shariah with their baseless interpretation and personal opinions. All of these transmogrifiers and mutilators of the Deen are human shayaateen who are being inspired by the jinn shayaateen. Allah Ta’ala always thwarts their pernicious plots and designs which they conspire against the Deen. This Deen has absolutely no scope for re-interpretation. (1) Jumu’ah Salaat at a university campus: According to the Hanafi Math-hab, one of the conditions for the validity of Jumu’ah is Ithnul Aam which means General Consent. If the Jumu’ah is held at a place which is not open to all, then the Jumu’ah Salaat will not be valid there. Therefore, it is necessary to conduct the Jumu’ah in such a place which everyone can attend unhindered. If the university campus is not open to all Muslims during the duration of the Jumu’ah Salaat and Khutbah, then Jumu’ah will not be valid there in terms of the Hanafi Math-hab. Hanafis cannot then perform Jumu’ah at such a campus. According to the Maaliki Math-hab, the necessary condition for the validity of Jumu’ah is that the Jumu’ah be conducted in a properly erected Jaami’ Musjid. Thus, according to the Maaliki Math-hab, Jumu’ah is not valid on a university campus. In this case followers of the Maaliki Math-hab will have to perform Zuhr Salaat if there is no Jaami’ Musjid in the city. According to the Hanafi Math-hab, the minimum number of musallis necessary for the validity of Jumu’ah is three, the forth being the Imaam. According to the Shaafi Math-hab, the minimum number is 40 resident male adults who are all Muqeem. They should not be musaafir. Muqeem in this context here means a permanent resident of the place as well as a traveller who has made the intention of staying at the place for at least four full days. Thus, if in the congregation there are 39 residents and one traveller or one minor, then the Jumu’ah will not be valid for Shaafis. According to the Maaliki Math-hab, the minimum number is 12 adult males who are residents of the place. According to the Maaliki Math-hab a Muqeem is either a permanent resident or a traveller who intends to stay for at least four days in the place where Jumu’ah is being performed. The number of musallis has to be twelve besides the Imaam. In terms of the Hambali Math-hab the validity of Jumu’ah is dependant on 40 adult males who are permanent residents of the place. This number includes the Imaam. (a) If the place where Jumu’ah is being performed is a university campus which does not allow the general Muslim public to enter during the duration of Jumu’ah, then Jumu’ah will not be valid regardless who the Imaam may be, even if he is a follower of any other Math-hab. (b) If the number of musallis is 40 or more (residents), and the Imaam is a Shaafi or a Hambali, then the Jumu’ah on the campus will be valid for Shaafis, Hambalis as well as Maalikis, but not for Hanafis as mentioned earlier. If in this case (40 performing on the campus), the Imaam is a Maaliki or a Hanafi, then the Jumu’ah of the Maalikis, Hambalis and Hanafis will not be valid. But, the Jumu’ah of the Shaafis will be valid. If in this same case the Imaam is a Hanafi, the Jumu’ah of the Hanafis, Maalikis and Hambalis will not be valid while that of the Shaafis will be valid. If in this same case (40 or more performing on the campus) the Imaam is a Hambali, then the Jumu’ah of the Hambalis, Shaafis and Maalikis will be valid while that of the Hanafis will not be valid. FROM THE ABOVE IT WILL BE SEEN THAT IN THE ABOVE CASE THE JUMU’AH OF HANAFIS WILL NOT BE VALID UNDER ANY CIRCUMSTANCES. (c) If the number of musallis performing on the campus is less than 40, then the Jumu’ah will not be valid in terms of all four Math-habs whether the Imaam happens to be Hanafi, Shaafi, Maaliki or Hambali. Even if the Imaam is a Maaliki and the number of musallis exceed 12 adult resident males, Jumu’ah will not be valid for Maalikis on a university campus because one of the conditions for the validity of Jumu’ah according to the Maaliki Math-hab is that the Jumu’ah has to be performed in a Jaami’ Musjid. (2) It is not permissible for the Khateeb to be without a beard nor is it permissible for him to cut his beard less than a fist length which is the prescribed minimum length. Although the Jumu’ah will be validly discharged even if the Salaat/Khutbah are conducted by such a faasiq Imaam, nevertheless, it is sinful to appoint such a faasiq to be the Imaam. The reward of the Jumu’ah is diminished or destroyed. Likewise it is not permissible for the Khateeb to be without Islamic dress. It is forbidden to wear western/kuffaar garb. Nevertheless, despite the prohibition and the sin involved, the Jumu’ah will be valid even if such a faasiq conducts it. It is permissible to be without a staff. The Khateeb need not take a staff when delivering the Khutbah. In fact, in these days it is not permissible to hold a staff on the Mimbar because this practice has become a bid’ah (innovation). People have been misled to believe that it is compulsory for the Khateeb to hold a staff when delivering the Friday Khutbah. (3) Recitation of both Khutbahs in Arabic is essential. This has been the practice of the Ummah from the earliest days of Islam. To depart from this practice is sinful. Nevertheless, the Jumu’ah will be valid even if the Khateeb commits the sin of reciting part of the Khutbah in Arabic and part in another language. But, it should be well remembered that it is not permissible to recite the Khutbah in any language other than Arabic. There is a difference between validity and permissibility. While it is not permissible to recite in any other language, nevertheless, the Khutbah will be valid if part of it is in English. (4) It is not a requisite for the Khutbah to consist entirely of Qur’aanic and Hadith narrations. In addition to such narrations, other admonition may also be incorporated. (5) The second Khutbah is more praise and prayer while the focus of the first Khutbah, beside the praise and prayer, is also on Naseehat (admonition/Tableegh). The Imaam of the Musjid has the prior right to conduct the Jumu’ah Salaat and Khutbah in his Musjid. If there is no fixed or permanent Imaam, any qualified Muslim may be appointed to execute this duty. It may be a different person each week. It should be remembered that according to the Maaliki Math-hab, the same person who recites the Khutbah should lead the Jumu’ah Salaat. If different persons execute this, then the Jumu’ah will not be valid in terms of the Maaliki Math-hab. It is permissible to ask a traveller from a different country to perform this duty. However, the conditions for the validity of Jumu’ah in terms of some Math-habs should not be overlooked in this case, e.g. if the traveller who has not made an intention of staying four days or more, is appointed to conduct the Jumu’ah and the number of musallis is 38, then the Jumu’ah will not be valid for Hambalis, Shaafis and Maalikis although it will be valid for Hanafis (i.e. if performed in a Musjid or a place where the condition of General Consent is found). (7) Both Khutbahs should be delivered by the same Khateeb. 1. Jesus (‘Eesa al Masih alayhissalaam) taught that there is only One God and Only God should be worshipped as taught in Deut 6:4, Mark 12:29. Muslims also believe this as taught in the Qur’an verse 4:171.
in the Qur’an verse 6:145. 3. Jesus (‘Eesa alayhissalaam) greeted with the words “As-salaamu alaikum” (Peace be with you) in John 20:21. Muslims also greet each other this way. 4. Jesus (‘Eesa alayhissalaam) always said “God Willing” (Insha’ Allah), Muslims say this too before doing anything as taught in the Qur’an verses 18:23-24. 5. Jesus (‘Eesa alayhissalaam) washed his face, hands, and feet before praying. The Muslims do the same. 6. Jesus (‘Eesa alayhissalaam) and other prophets of the Bible prayed with their head to the ground (See Matthew 26:39 ). Muslims do too as taught in the Qur’an verse 3:43. 7. Jesus (‘Eesa alayhissalaam) had a beard and wore a throbe. It is Sunnah for Muslim men to do the same. 8. Jesus (‘Eesa alayhissalaam) followed the law and believed in all the prophets, (see Matthew 5:17 ). Muslims do too as taught in the Qur’an verses 3:84, and 2:285. 9. Jesus’ mother Maryam (Bibi Maryam) dressed modestly by fully covering her body and wearing a headscarf (hijab) as found in 1 Timothy 2:9, Genesis 24:64-65, and Corinthians 11:6. Muslim women modestly dress the same as taught in the Qur’an verse 33:59. 10. Jesus (‘Eesa alayhissalaam) and other prophets of the Bible fasted up to 40 days (see Exodus 34:28, Daniel 10:2-6. 1Kings 19:8, and Matthew 4:1-Muslims do so also during the month of Ramadan. Muslims are required to fast the full obligatory 30 days (See Qur’an 2:18), and others take it a step further by fasting an additional 6 days to increase their rewards. (See Luke 10:5), and to also greet the people in the house with “peace be unto you”. Muslims do exactly what Jesus (‘Eesa alayhissalaam) did and taught. When we enter our homes and the homes of others we say “Bismillah” and also greet with “As-salaamu alaikum” (Peace be upon you) as taught in the Qur’an verse 24:61. “Everlasting covenant” (See Genesis 17:13 ). In the Qur’an verse 16:123 Muslims are required to follow the religion of Abraham. The Prophet Muhammad (sallallaahu alayhi wasallam) said, “The Prophet Abraham circumcised himself when he was eighty years old.” (See Sahih Bukhari, Muslim, and Ahmad). 13. Jesus (‘Eesa alayhissalaam) spoke aramaic and called God ”Elah”, which is pronounced the same as “Allah”. Aramaic is an ancient Biblical language. It is one of the Semitic languages that also include Hebrew, Arabic, Ethiopic and the ancient Assyrian and Babylonian language of Akkadian. The Aramaic ”Elah” and the Arabic “Allah” are the same. The Aramaic “Elah” is derived from the Arabic “Allah”, and it means “GOD”. “Allah” in Arabic also means ”GOD”, the Supreme GOD Almighty. You can easily see the similarity in their pronunciation so this concludes that the God of Jesus is also the God of the Muslims, of all mankind, and all that exist. Now tell me who is the real follower of Jesus (‘Eesa alayhissalaam)?? Those who support the idea of women studying at university argue that Muslims need to be progressive in their thinking. Confining women to their homes is narrow minded they say. (Such persons are zindeeqs. Their brains have been polluted by shaitaani manipulation. They are muslim by name, not at heart – Mujlisul Ulama) This argument implies that all those women who choose to be homemakers are backward. But this is not at all true. Homemaking was the way of the Sahabiyaat and pious women throughout the history of Islam. Women who followed this path produced the Junaid Baghdadis and Hasan Basris of this Ummah.Homemakers are the foundation of the Muslim Ummah. If this foundation crumbles the Ummah will be left in free fall. We need to be unapologetic about this: homemaking is the most progressive career that a female can follow. Some women also argue that a degree will be beneficial if their marriage fails and they are left single. (They enter marriage with the satanic idea of it collapsing in divorce. Their brains are convoluted with the ways of thinking of their western kuffaar counterparts. Their marriages flounder on the rocks because they acquit themselves as satanists. -Mujlisul Ulama) However, it seems quite odd for women to want to study for a degree in preparation for the unfortunate scenario of a failed marriage. Should they not rather be spending their pre-marital time acquiring Islamic knowledge and skills associated with homemaking so that their marriages succeed? The beauty of Islam is that it has not burdened a woman to provide for her family. Earning is the husband’s responsibility. She is not forced into an abyss where she has to both earn and take care of her home. Forcing women into such a role is unjust, cruel and materialistic. (The problem with these lewd, immoral university women is that they are not forced to attend. They sell their chastity and their bodies by their volition to gratify their inordinate satanic lusts.- Mujlisul Ulama) Statistics have shown that in the days of the industrial revolution when women left their homes to pursue a career outdoors, they suffered an increase in psychological problems such as anxiety. Reality proves this point. The majority of Muslim females who attend university do not dress Islamically. Many such females find their marriage partners on campus. These are obviously love marriages where dating began while they were studying. Many parents do not know that their daughters go out on social outings with their male friends instead of attending lectures. (Here the writer is displaying extreme naivety. Most parents are fully aware of the zina and filth in which their sons and daughters at university are embroiled in. But, for the sake of the dunya and future MONEY, they pretend to be stupid of the immoral frolicking of their children in vice. – Mujlisul Ulama) Muslim females are also known to have entered into haraam relationships with non-Muslims males on campus. (The same applies to Muslim males- Mujlisul Ulama) There have also been cases where male lecturers have dated and later married their female students. When the conditions in Muslim schools have become so immoral, what can we expect of a campus scenario where there is no supervision? It is no secret that a campus environment is free and unrestricted. Lectures do not have pardah facilities. Tutorials and group projects require interaction and discussion. Muslim females who have some degree of modesty feel it difficult to lower their gazes during such interactions for fear of being unfriendly. (It is moronic, to say the least, that a Muslim woman of even some modesty will be present in the zina environment of a university. Only such Muslim woman who are totally bereft of haya will attend the abode of vice and immorality. – Mujlisul Ulama) Males and females engage in casual (zina) conversations between lectures, when sharing notes and travelling to and from campus. Even the most conservative of females are forced into interacting with males in such circumstances. (There are no ‘conservatives’ in an immoral zina environment. – Mujlisul Ulama) Anyone who has studied at campus can identify with this setup. It is unIslamic for many reasons. We cannot also be blind to the fact that campuses have drugs, alcohol and a nightclub culture together with all the evils these bring with them. Campuses are also havens where dubious sects and groups thrive under the guise of free thinking. Hence, modernists and Shias find free reign here. Lecturers and students who may range from atheists to Darwinists often corrupt the minds of those who are not well-grounded in the basics of Islam. The spiritual dangers of campus life are real and unavoidable. No matter how many precautions a Muslim female student (or a Muslim male student) takes, she/he will have to compromise her/his Islamic values at some time or the other. (In fact, their very Imaan has to be compromised. Innumerable former Muslim boys and girls lose their Imaan in shaitaan’s den of villainy. – Mujlisul Ulama) To hope that she remains Islamically safe in such a sinful environment is like jumping into a pool of water and hoping not to get wet. We cannot also forget that the idea of Muslim females (and Muslim males) attending university suits the kuffaar agenda perfectly. In their worldview they need Muslim females to emerge from their homes as students and professionals so that the Muslim home crumbles. The kuffaar know well that corrupting the minds of the females of the Ummah is an easier way of winning the war against Islam as compared to sending drones and armies. Muslim parents who allow their d aughters to attend university should seriously introspect. (The parents themselves are morally corrupt with their Imaan dangling on a thread, hence they find it pleasurable to barter away the honour and chastity of their daughters. – Mujlisul Ulama) Is it worth it sacrificing one’s modesty (and even one’s imaan in some cases- in fact, in most cases) in exchange for a university degree? (A Donkey degree – Mujlisul Ulama) Islam can never permit its women (and its men) to pursue education in such an environment where maintaining their Islamic values is near impossible. It is important to note that Islam does not discourage females from being educated (i.e. Islamically). Islam encourages (in fact, makes it obligatory – Waajib for) females to acquire an education in the basics of Islam. In fact, this is imperative because a mother who is not well-grounded in Islam cannot correctly guide and nurture her children. Hence, Muslim women should acquire knowledge of Quran, Sunnah, Aqidah, Fiqh, etc. through the correct channels. (The correct channel is the home environment where the family girls may be taught by mahram male Ustaadhs. The correct channel is not these new-fangled girls madrasahs which are unnatural aberrations in the Ummah. The haya of the girls is ruined even in these institutions where they are in close contact with male teachers. The ‘screen’ is a deceptive purdah which does not safeguard the haya of the girls. Shar’i purdah is not confined to the screen. Furthermore, these institutions rob the girls of the treasure of the mother’s companionship during their most formative years. They emerge from these madras like zombis and robots. Later they flounder in married life. The years they squandered in the madrasah deprived them of practical experience of running a home. Regarding secular and worldly subjects, women may pursue studies if there is a genuine need to do so and it is in a setting that is free of sin. (Such facilities are to be found in dreamland. -Mujisul Ulama) Unfortunately, university campuses do not make the grade. Women should remember that their primary responsibility is homemaking and bringing up children. Their core focus and training should be in this field. This is the Islamic teaching. Nabi Sallallahu Alaihi Wasallam instructed his daughter Faatimah Radhi Allahu Anha to take care of the household while her husband Ali Radhi Allahu Anhu was told to earn a living outdoors. This is the natural divine system ordained by Allah and His Rasool Sallallahu Alaihi Wasallam. It is the only system that can produce a harmonious and successful society. The aforegoing pertinent article presented by the Brother/Sister who had studied at one of these shaitaani dens of immorality, fisq, fujoor and kufr highlights old news. Whatever the writer has aired is not new. The writer has merely echoed the warnings and views we had been disseminating for decades about these evil abodes of Iblees. The writer is most fortunate that he/she has emerged with Imaan intact despite, most certainly, having been extensively and even intensely scathed by the filth in the satanic university cauldron. No one can ever hope to emerge unscathed from the worst kind of filth in which universities excel. It can be safely said that brothels are infinitely better off than these shaitaani university haunts which are the headquarters of Iblees where he ruins and destroys Imaan and Islamic morality. Undoubtedly, history has not produced a viler devilish institution than a western university which eliminates all vestiges of humanity and morality in the name of education. The disaster of the evil consequences of university kufr and fisq education applies greater to Muslims than non-Muslims. Non-Muslims are natural carriers of the diseases of immorality and kufr. Shaitaan’s main targets for his plot are the Muslim students whose Akhlaaq he succeeds to utterly destroy and whose Imaan is eliminated. Those who emerge with their Imaan still intact, have been saved by Allah Ta’ala. But they are few, and they too are severely tarnished with the immorality which have contaminated their hearts and thinking. It is not possible to remain boiling in the cauldron of the worst fisq and fujoor, but remain unscathed and emerge with Taqwa. Supposedly pious Muslims who appear to be conscience of the Deen and whose appearance and general outlook of life is Deeni, while believing that it is haraam for Muslim girls to be cast into the university’s cauldron of fisq, fujoor and kufr, fail to realize that the evil of the satanic den of vice is not restricted to girls. It affects and destroys even the males in exactly the same way as the females are debauched, pillaged and ravaged. There is no difference between boys and girls regarding the prohibition to attend university. Just as attending university is Haraam for girls, so too is it Haraam for boys. Allah’s ahkaam are not confined to males. It is indeed the understanding of convoluted minds – convoluted by shaitaan and the dunya – that only Muslim girls are prohibited from attending the abode of Iblees. Their understanding is irrational and confounded with shaitaani logic. All the vices which have been enumerated in the aforegoing article, and many more which have not been discussed, are vices for males as well. It is surprising that even those discourage females from universities, have Molvis whono qualms about males destroying themselves in the university’s cauldron of vice and shaitaaniyat. The argument of professions to justify attendance by Muslim males is absolutely putrid and baseless. The objective of a secular profession is nothing other than the quest for Rizq . Any other argument is pure deception and the inspiration of shaitaan. Those who proffer altruistic objectives for pursuing university education, are agents of Iblees. The objective of everyone who plunges into the cauldron of immorality and kufr is only MONEY which has become the maqsood of life on earth for even Muslims, even for the vast majority of the Ulama who have lost their Imaani bearings, hence almost all activities of fisq, fujoor, lahw and la’b are halaalized. While the one and only Maqsood accepted and of the Mu’min on earth is the Destination of the Aakhirah which is attainable only by obedience to Allah Azza Wa Jal, even the ulama with their corrupt fatwas and westernized ideologies have negated this Objective. Islam commands Muslims to pursue the Maqsood of the Aakhirah, and in this process to sacrifice and even lose worldly success. Whoever sets his sight on Allah Ta’ala and the Aakhirah will most assuredly have to bear mundane loss and deprivation. But such ‘loss’ is no loss in reality. It is part of the trial which Allah Ta’ala has schemed for His Mu’min servants. For the Believers, the true life of success, comfort and happiness is the Aakhirah – in Jannat, not this ephemeral corrupt dunya which Rasulullah (Sallallahu alayhi wasallam) described as ‘jeefah’ (rotten carrion). Sacrificing and harming your dunya for the sake of the success of the Aakhirah are commendable and totally acceptable. But, harming your Aakhirah in pursuit of worldly goals is intolerable and Haraam. The Mu’min’s primary concern is Ibaadat and Taa-at (Obedience to Allah Ta’ala) because he has been created only for this objective. Hence Allah Ta’ala states in the Qur’aan Majeed: “I have not created Jinn and Man except that they worship me.” In the context of this Aayat, ‘worship’ (Ibaadat) has a wide meaning. It is not restricted to ritual acts of Ibaadat. In every sphere of life and in every aspect of every sphere, Taa-at (Obedience to the Divine Laws) is obligatory. Any activity which is inimical to the Maqsood is Haraam. The Muslim’s concern is never the attainment of mundane success at the expense of violating or compromising the Law of Allah Azza Wa Jal. Therefore, regardless of the mundane benefits of secular professions, if such education is available only in a satanic cauldron of immorality and kufr, it will be Haraam to pursue it. The focus of the Muslim is on Allah’s Pleasure, not the benefits of the world. Regarding Rizq which is the primary objective of all these secular professions, it (Rizq) is the Responsibility of Allah Ta’ala. The One Who has created the mouth feeds it. It is not the profession and the worldly means and agencies which are the providers of our Rizq. Rasulullah (Sallallahu alayhi wasallam) said: “Rizq is sealed and the one of greed is deprived.” Rizq follows one like one’s shadow. It is inseparable from a person. This is not opinion. It is mentioned in the Ahaadith. Whether a person acquires the highest kufr university degrees or whether one remains an illiterate rustic, one’s Rizq is assured. Therefore, all such arguments justifying the ruin of Akhlaaq and Imaan for the sake of pursuing worldly careers are fallacious and satanic. While the goal of university education is worldly success, the emphasis of Islam is moral reformation and spiritual elevation. Minus this, Allah’s Pleasure cannot be attained, and there will be only failure and regret to no avail at the time of Maut, and Maut is not a distant, remote event belonging to the realm of dreamland. Its action is observed daily. While Barzakh and Qiyaamah passive and dead are beliefs which are tantamount to disbelief in so far as most Muslims are concerned, Maut is a vivid reality, the inescapable reality which no one can ever deny. Thus, Rasulullah (Sallallahu alayhi wasallam) said that the most intelligent one is he who makes preparations for Maut and the life thereafter. It is gross jahaalat supreme ignorance to pursue the dunya at the cost of — ruining and destroying one’s Aakhirah. Some girls and even boys who Deeni inclinations seek advice have from us when their parents compel them to attend the abode of zina, fisq, fujoor and kufr. They seek the Shariah’s ruling regarding obedience to parents. Understand well that obedience to parents is not permissible in Haraam acts. Obedience is Waajib in only acts which are permissible in the Shariah. When parents issue haraam instructions, then disobeying them is Waajib. With politeness, respect, but firmness, the desire of parents should be set aside and ignored when it is in conflict with the Law and Pleasure of Allah Ta’ala. Some of the ‘khulafaa-e-mutakh-khireen’ (the later spiritual mentors) of this lofty branch (of Tasawwuf, viz., Naqshabandiyah) have been guilty of the introduction of bid’ah practices into the Path. Consequently, they strayed from the Path of the Seniors (Akaabir). They have thus lost the direction of the Senior Mentors of this Path. A group of the disciples of these later mentors (who had gone astray by their introduction of bid’ah) hold the i’tiqaad (belief) that the perfection of this Path (of Naqshabandiyah) is to be achieved via the means of these bid’ah practices. Allah forbid! Never is this possible. A large group of ‘sufis’ have made their exit from the confines of the Shariah. They labour in the deception that they have emerged from the shell of the Shariah and have attained the essence of Tariqat. This deception is among the errors of the sufis. In this way many imperfect persons have embraced atheism and irreligiosity and have made their exit from the glittering circle of the Shariah. Thus have they gone astray and have led others astray as well. Barkat and Fuyooz (spiritual grace and benefit) remains only as long as bid’ah has not been introduced into the Path (tareeqat). When bid’ah is innovated into the Path (of Tasawwuf), the spiritual effulgence and benefit of the Path come to a halt The mashaa-ikh (spiritual mentors) of other Paths of Tasawwuf too have introduced bid’ah practices based on their intentions and opinion. And, among these mentors of Naqshabandiyah too, a group of later mentors have shunned the lofty Way of their predecessors and have innovated the practices of samaa and raqs (spiritual darkes and music) and zikr jahr (loud forms of zikr). People of this calibre ( i.e. mentors who have introduced bid’ah) by virtue of spreading bid’ah have extremely little relationship with the Seniors of this Path (of Naqshabandiyah) which is a Path established of Sunnah. There are those in this Path who have by virtue of their short-sightedness accepted the bid’ah practices and by means of these bid’ah have; attracted the hearts of people towards themselves. They labour under the deception that their bid’ah practices have achieved the perfection of this Path. Allah forbid! Never is this possible. In reality, this group (of innovators) have initiated the annihilation of this Path. The way of najaat (salvation) is obedience to the Shariah of Rasulullah (sallallahu alayhi wasallam), both in belief and practice. The mureed (disciple) submits himself to an Ustaad or Peer (Spiritual Mentor) for this very reason – that the way of the Shariah is indicated and by virtue of its grace, practice and belief of the Shariah is made easy. The purpose of being initiated into the Path is not to obtain freedom for the disciples so that they may do as they please and eat as they please the Spiritual Mentors becoming the shield of their disciples, saving them from the punishment (of the Hereafter). This is a hollow wish. There (in Qiyaamah) no one will be able to intercede on behalf of another. without Divine Permission. In this age many have donned the garments of the Sufis and are masquerading (as spiritual mentors). They are advertising the question of ‘wahdatul wujood’ (unification with Allah) and besides this question they know of no other goodness. They have deprived themselves of the reality of true knowledge. They have dragged the actions of the Senior Mashaa-ikh into the scope of their forged and baneful interpretations and in this manner have set themselves up as the leaders of the community. By means of their deception they are seeking to create a boom in the slump which their market (which involves the plunder of mean) has suffered. Spiritual exercises which have been adopted besides the taqleed (following) of the Sunnah of Nabi (sallallahu alayhi wasallam) are of no significance because even Hindus, Yogis, Brahmins and the Greek philosophers are their co-partners in such forms of soul-exercising practices. These soul and mind exercises are nothing but error for them. They are led astray by these very practices. These ‘mind over matter’ practices indicates to them no road other than the path of spiritual ruin. In the view of Tareeqat even the ‘shathiyaaf (statements which are made in ecstacy) of the Mashaa-ikh which are in contradiction of the Shariah, are on the stage of kufr. The true Auliyaa who have been infused with the wealth of Islam are pure from such disrespect and are the firm followers of the Ambiyaa, both in the zaahir (external path) and in the baatin (internal path). These mentors of bid’ah accord priority to the observation of the day of Aashuraa, the day of Baraat, the 27th night of Rajab and the first Jumu’ah night of the month which they name ‘lailatur – raaghib’. They observe these occasions with the utmost of preparation, and with the fullest of contentment do they perform Nafl Salaat in congregation. They regard these practices as meritorious. But, they are unaware that these practices (the manner in which the innovators are practicing) are among the deceptions of shaitaan who presents evil in the form of virtue.